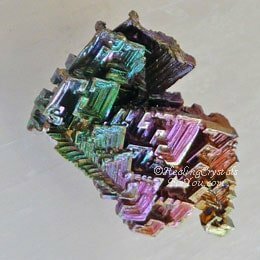 Bismuth is a lovely stone to create a connection with Spirit as well as with others. 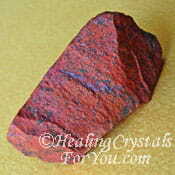 This is a manmade stone, but it still carries a quite powerful energy. Their energy may help to bring members of a group together, and may assist them to work towards a common outcome. 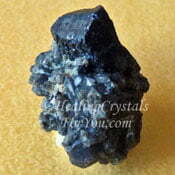 Although the crystal specimens are not natural these stones have useful crystal properties. 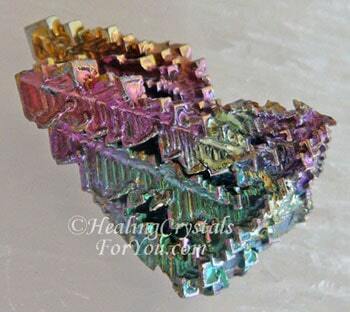 These crystals help to bring a sense of calm and tranquility into your life, and may help you to make changes that are quite transformative in nature. It works to modify the energy coming in at the crown chakra so that it can energize the base chakra and this vibration is known to stimulate the rising of the kundalini. 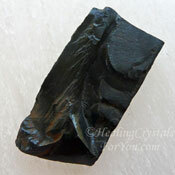 The natural raw mineral is found in its raw state in combination with other minerals and this is generally never available, for metaphysical use. 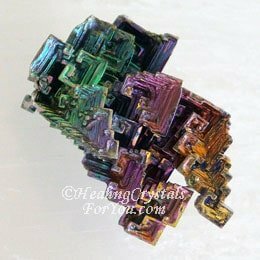 This mineral is used in a process where it is manufactured into quite beautiful geometric crystal specimens which are commonly seen selling. 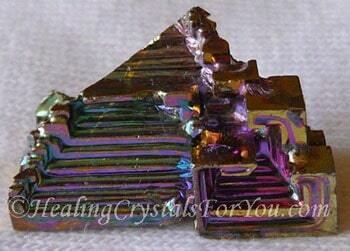 The colors are quite amazing as are the beautiful pyramids that they form in. The meaning of the name of this mineral relates to the German word meaning white mass, but as it was named around 500 years ago no one is quite sure where the meaning originated. Why Would You Use It? How Will It Help You? 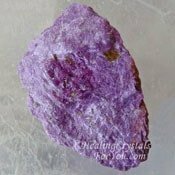 Unlike many stones that cause the energy to rise from the base or root chakra, these stones instead modify the energy at the crown chakra and send the kundalini energy back down to the base or root chakra. 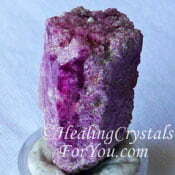 At the crown chakra they are known to assist you to experience greater knowledge, foresight and improved judgement. Use them in group situation to bring members of the group together. 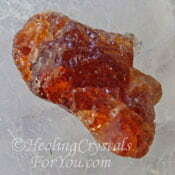 These specimens are known to have useful healing attributes as they are very stimulating to the body. 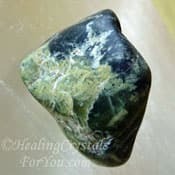 They are known to assist you to adapt to high vibration stones, and may be helpful to assist you to make a deeper connection to the Universal mind, to all that is. 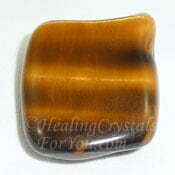 They may help you to adapt when you are experiencing feelings of loneliness, separation or feeling apart from others. "Forgiveness says you are given another chance to make a new beginning." Desmond Tutu. 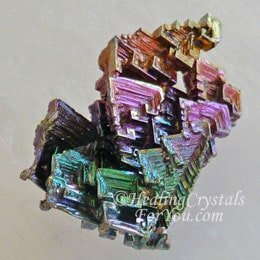 You may choose to combine these stones with other stones that stimulate kundalini activation, but keep an awareness that they have an opposite effect to most stones used for this purpose. 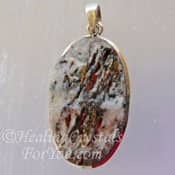 There are a number of other stones you may choose to stimulate the kundalini energy including Bixbite, Serpentine, Stichtite, Brookite, Triplite, Tigers Eye, Jet, Snakeskin Agate, Cuprite or Astrophyllite. 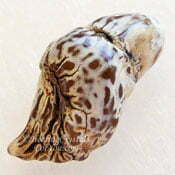 Check out the page on this subject to learn more.